Why we need sleep and what happens during that process is an area of great interest for both the basic and clinical neurosciences. I recall listening to a lecture by Giulio Tononi at the 75th Anniversary of the University of Wisconsin's Department of Psychiatry on a theory of how synapses were processed during sleep in order to renew the brain's learning capacity for the next day. I encountered a fascinating paper in this week's Science magazine on a possible sleep function that I have never seen described before - flushing toxins out of the brain. The lead author hails from the Division of Glial Disease and Therapeutics, Center for Translational Neuromedicine, Department of Neurosurgery, University of Rochester Medical School. That probably says a lot about the focus of the paper and that is the movement of interstitial fluid (ISF) as it circulates through the interstitial spaces around neurons and removes toxic waste products including β-amyloid (Aβ) Since the brain lacks a lymphatic system convective exchange between CSF and ISF controls this turnover. One author named the system the glymphatic system since the system is dependent on astrocytic aquaporin-4 (APQ-4) channels for establishing the convective movement of ISF and this is homologous to peripheral lymphatic movement and removal of toxic byproducts from peripheral tissue by the lymphatic system. The authors also note that the observation that (Aβ) protein has been observed to be at a higher concentration in the daytime as opposed to during sleep. To explain this one hypothesis was that production was greater in the daytime. They tested the alternate hypothesis that glymphatic clearance is greater at night. The basic experiment for the paper involved teaching mice to sleep on a two-photon microscope. That allows imaging of dye moving through living tissue. The researcher would inject mice with green dye at sleep onset and red dye upon awakening. 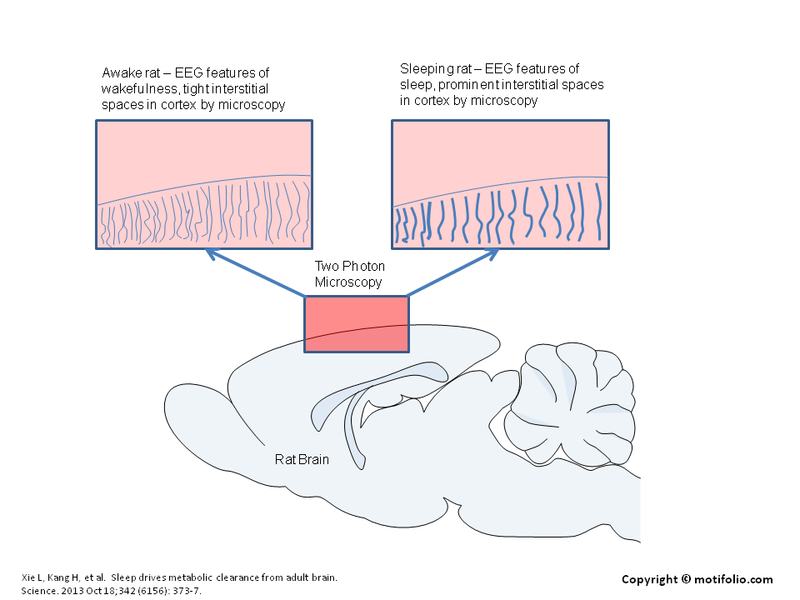 They could determine that during sleep a much higher volume or CSF flowed through the brain. They also injected labelled (Aβ) protein and showed that the brain of a sleeping mouse cleared these proteins twice as fast. The art below shows the experiment and the 60% increase in channels carrying CSF during sleep. I would encourage anyone interested to read the original in color as Science has outstanding graphics. To download my original PowerPoint slide use this link. The authors went on to demonstrate that the increase in interstitial space was a sleep related phenomenon because it could be induced by natural sleep and anesthesia but not circadian rhythm. In looking for a mechanism they postulated that adrenergic mechanisms associated with arousal like locus ceruleus derived noradrenergic signaling was involved. They demonstrated that adrenergic antagonists could induce the expected increase in tracer influx and interstitial volume so that it was similar to what was seen in the sleep state. Implications for psychiatry? To some extent, those of us interested in neuroscience and not forgetting what we learned in PChem will always be interested in article at the interface between the biochemical and the biophysical. Despite having this elegant system coupled with our arousal state and metabolic state none of this information was around during the recent Decade of the Brain. The authors discuss the sensitivity of neurons to various toxic products and proteins and the implications for neurodegenerative diseases. I can start with insomnia and build from there. People with addictions can have sustained insomnia and associated impairment in cognition the next day. Delirium also affects the sleep-wake cycle and some experts have suggested that two different types of delirium can be distinguished based on EEG spectra. The obvious questions are is the insomnia associated with these states literally toxic to the patient by restricting ISF clearance? Another key correlate mentioned by the authors is the decrease in ISF with age. Does that account for the predisposition to delirium and protracted delirium as people age? And finally what about the toxicity of medication? We are used to receptor based explanations of why certain medications have sustained or unexpected toxicity. How much of that is due to a collapsed ISF and restricted clearance to the CSF? Brain energetics is also an interesting question specifically the AQP-4 channels. Most psychiatrists are familiar with the renal aquaporin channels when considering renal water metabolism. The fact that you have these channels on astrocytes and that removing them reduces (Aβ) clearance by 65% is fascinating and seems like another potential intervention point for brain disease. What needs to happen to keep these AQP-4 channels healthy and what happens when they are not? There are many more questions that come to mind based on the mechanism these authors have elucidated. I hope that papers like these are translated into both clinical research and our thinking about newer and more innovative ways to think about whole brain function and think about all of the mechanisms instead of just the usual receptors. Footnote: I decided to update (12/13/2013) this post by adding this interesting piece of news. According to Altmetric, this paper received the 4th highest rating of online interest in scientific papers. For the Top 100 papers click on the link. Nobel prize winning economist Joseph Stiglitz came out with a recent commentary of the economic recovery and why things are not a rosy as they seem. He points out that many of the structural problems with the economy including predatory lending and credit, abuses by the credit card industry and abuses by the credit reporting industry are still in place. In addition there are inadequate capital reserves and no real limits on the kind of low risk speculation by certain parts of the financial services industry - the basic problem that started everything 5 years ago. I have been posting in political forums for the past 15 years that the American economy at times seems to be based on a fantasy rather than the way a real economy should work. We have taken an alleged retirement system (401K, 403B) and turned it into a windfall for the financial services industry. Instead of an actual retirement system, we find that the average American is not able to put away nearly enough to retire and in the process ends up paying significant fees to financial services companies. In return for these fees they receive the standard boilerplate about no guarantee against losses and frequently have very poor investment choices since they are determined by their employer. At the same time, low risk retirement vehicles like money market funds are paying negligible amount of interest. Rather than being a reliable retirement system this is essentially another tax on the American people to fund the financial services industry. Retirees are left with the option of accumulating cash only or putting their retirement funds at significant risk all of the time in order to accumulate enough capital to retire. We are in the process of starting a huge health care mandate know as the PPACA or more popularly as Obamacare. It will create a large influx of capital into the healthcare system based on coverage mandates. The American health care system is currently the most expensive system of health care in the world. The standard model used by the federal and state government has been to use managed care companies as intermediaries to contain costs. There should be no doubt that model is a near total failure. Recent data for example suggest that a couple nearing retirement should have an additional quarter of a million dollars saved for health care expenses during retirement beyond the cost of Medicare. The health care system in this country can be viewed as a second tax on the American people. How do Americans end up with two additional taxes being levied on them in addition to the usual income, Medicare, Social Security, sales, and property taxes? How does it happen when we have a supposed radical element of one of the major parties working on fiscal responsibility? I think it comes down to one American institution and that is the US Senate. The Senate is full of aging, wealthy politicians who have worked for years to develop a power base in Washington and keep it. They are completely out of touch with what the American people need and pass laws that will largely benefit the businesses that they are heavily lobbied by. In some cases, they wrote the laws to invent the industry. The disconnect of this group from the public was evident during the recent stand off to shut down the government and nearly default on our creditors. In other words they risked the world economy to make a point instead of fairly representing what the average American wanted at that time. 1. Managed care and the disproportionate rationing of psychiatric services: Apart from Harold Eist, MD and a recent lawsuit against a managed care company there has generally been silence on this issue. Some literature was generated regarding how to work with meager rationed resources but nothing about how to fight back as managed care became a government institution. The APA's support of collaborative care means we have come full circle and the APA is explicitly backing a managed care model that involves treating patients without actually seeing them. 2. The response to accusations of conflicts of interest related to the pharmaceutical industry: There was a well known initiative against some prominent psychiatrists, the motivations for that initiative are still unknown. It is well known that many academics in many university departments have contracting arrangements with industries in order to supplement their salaries. It is well know that some professions charged with determining industry standards insist on industry representation in meetings where those standards are written. It is known that many professional organizations got more support from the pharmaceutical industry than the APA. The response to the attack from a Senator was to basically acknowledge that his attack was accurate and proceed with an appeasement approach that allowed critics of psychiatry to use this as additional rhetoric against the profession and any psychiatrist with a contracting arrangement. 3. The Maintenance of Certification (MOC) issue: This issue was forced by the American Board of Medical Specialties (ABMS) based on limited research. The APA immediately aligned themselves with the ABMS despite considerable complaints and a petition by the membership. The three examples given about are some of the main political issues for psychiatry, particularly the average working psychiatrist and the APA. To say that the interests of most psychiatrists are not represented by the APA is a massive understatement. Like the U.S. Senate, the APA seems almost totally disconnected from the people it is there to represent. I have heard many reasons over the years about how the actual structure of the APA is the problem. But nobody seems to want to remedy that problem. I attended a seminar at one point where an APA official explained the MOC issue and how it would actually create a financial burden for the American Board of Psychiatry and Neurology (ABNP), despite the obvious fee generation to take a commercially monitored and administered test. If it really is that burdensome - why do it in the first place? The initial rationale was that the public demanded it. It seems that there is now solicitation for public support. Who would not support an initiative to improve the competency of doctors - even if there is absolutely no evidence that a multiple choice exam with a high pass rate does that? I think it is highly likely that the political structure of the APA is very similar to the political structure of the Senate. While there is no lobbying there are ideas and affiliations based on those ideas. Any political structure that is so far removed from what its constituents want it driven by cluelessness, conflicts of interest, or a divine mandate. It is only logical to conclude that like the Senate, the issue is conflicts of interest. In the 21st century, patriotism is no longer the last refuge of a scoundrel - accountability is. The APA would do well not to follow the Senate on that course. Joseph Stiglitz. 5 Years In Limbo. Project Syndicate, October 27, 2013. "Unlike most of our crowd, I did not get over my craving for liquor much during the first two and one-half years of abstinence. It was almost always with me......" Doctor Bob's Nightmare. Alcoholics Anonymous, Fourth Edition, New York City, 2001, p 181. Craving to use drugs and alcohol is a common problem. As Doctor Bob points out in the above quote, craving is rare for alcoholics beyond the acute detoxification phase, but protracted for many other drugs depending on the class of addictive compound and the pharmacological properties of the specific drug. Apart from the biological determined heterogeneity of response to addictive compounds there are also the subjective aspects. In order strive for more objectivity, modern psychiatry has established diagnostic criteria for disorders of interest. These disorders are grouped in categories to seem uniform. Depending on the criteria of interest there is a broad range of subjective experience and description when describing common problem like anxiety and depression. Some people don't know the difference between them. Others have a mixture of both. Some people are anxious all of the time independent of their surroundings. Others get depressed or panic only in certain situations. The interpretation of what a person considers to be a craving is as diverse. Craving for an addictive drug or alcohol comes in many forms. It can be a perception of a physical property of the actual compound itself such as the taste, odor, appearance or consistency. It can be physical acts associated with its use and a common example there is a feeling that cigarette smokers get when they feel like they need to do something with their hands after they stop smoking. It can be cue induced like being offered a drug or being in a place where previous drug transactions occurred. It can be recall of the first intense and protracted euphoric experience of using the drug even though that has long passed related to tolerance. The overwhelming affect associated with craving is anxiety and fear because of the sign on an impending withdrawal or relapse. The negative reinforcement that keeps addictions going after the initial states of positive reinforcement due to the euphorigenic effects of the drug is avoiding withdrawal. Craving may be a signal that acute withdrawal is imminent or that there is a state of chronic withdrawal. Craving has had an uncertain place in the field of addiction and the diagnosis of addictive states, largely because of the broad range of experiences associated with craving. This diagrammatic summary shows that various groups have considered the definition to be too vague. In other cases there was no consensus that craving was a universal enough phenomenon to be considered a diagnostic criterion. That changed this spring when the DSM-5 added craving and eliminated legal consequences of drug and alcohol use as a diagnostic criterion. Medications used to eliminate cravings probably led to that consideration, but people with cravings are more likely to relapse and have significant distress during recovery. The addition of cravings to the DSM-5 opens up a whole new area of focus during encounters with people who have addictions. Prior to this change the two major texts on addiction devoted about 3-4 pages to craving phenomena. Addiction psychiatrists and addictionologists may have already been focused on this area, but I think that overall it makes ongoing assessments more dynamic because it is an intervention point for physicians and there are a number of medical and non-medical interventions that are possible. Omar Manejwala, MD reviews the options in his very readable book entitled Craving. This book is interesting because it gives a number of practical tips on how to counter cravings based on the substance involved as well as the importance of psychosocial interventions like 12-step recovery and how that might work. Addiction science has probably been at the cutting edge of neurobiology for at least the past decade and with this focus there is often the implicit understanding that we are searching for some medication that will be an immediate solution to craving. In some cases we have that medication, but I always emphasize that cravings at some point disappear and that there are non medication approaches to addressing them. Manejwala O. Craving: Why We Can't Seem To Get Enough. Hazelden, Center City, MN, 2013. I hear you brother. I thought that level of anxiety over the balance between doing the impossible and not doing harm might fade away over the years but it has not. In psychiatry a lot of it depends on the level of complexity that your patients have. It can be an acute situation but more often than not - it is a problem throughout the day that you take home with you. Additional medical conditions, non psychiatric medications, polypharmacy, and difficult to treat disorders all compound the problem. I have designed a hierarchy to illustrate what I mean. It turns out that when I think about it, the acute problems seen by psychiatrists are not at the top. The problems at the top are typically problems where there is no good guidance, where you are on your own, left with biologically determined probabilities and you need to come up with your best estimate of what will happen given current circumstances. The problems encompass both psychiatry and the medicine associated with psychiatry. Let me provide an example of both. In the case of the psychiatric problem the usual scenario is a case of impaired judgment. Is the person at risk for death or self injury? Are they able to cooperate with the assessment and treatment plan. Do they seem changed to the point that you can no longer accept their responses as being accurate? Are you treating them for acute and chronic suicidal ideation and behavior? Any acute care psychiatrist ends up assessing thousands of the situations across the course of their career. It is often much more complex than an acute assessment. Many of these scenarios unfold in the context of ongoing psychotherapy and in order for the patient to be able to improve some risk is taken. In other cases there are calls to warn people and in extreme cases - calls to the police to check on a person who might be in trouble. I have not seen it studied but the stress of these situations for the psychiatrist involved is well known. Overthinking the situation in order to avoid the unexpected call that one of your patients has suicided or killed someone is common. In my conversations with medical students over the years, one of the main deterrents to psychiatric residency is the worry about suicide prediction. The medical situations are as complex and they frequently have no clear solution. A common scenario is that the person has a severe mental illness and they develop a problem that leads to to rethinking the medication they are taking. A common scenario is a person on maintenance therapy who suddenly develops a renal or hepatic problem necessitating a change in therapy. The best example is bipolar disorder and lithium therapy. Lithium remains the drug of choice for many people with bipolar disorder and it can be highly effective. When I first started to practice it was common to see people who had repeated institutionalizations for bipolar disorder suddenly stabilized on lithium. Their functional capacity was restored and they were able to return to work and establish families. In those early days, the issue of lithium nephrotoxicity was not clearly observed. There was a major study of people on lithium maintenance for decades that showed no difference in renal function. In the last 15-20 years most nephrologists agree that lithium can lead to renal insufficiency and failure in a minority of patients on lithium therapy. In the case of a person that lithium has been working well for 30 years, there is no guarantee that anything else will work as good. That translates to no hospitalizations in a long time to frequent hospitalizations every year. Monitoring that therapy and in some cases following the patient while they are in dialysis or after transplantation is on example of a situation that you can't leave at the office. In many ways, the stress and anxiety in psychiatric practice is a measure of attempting to predict the unpredictable. Psychiatry has accurately said that psychiatrists can't predict future behavior or rare events to explain why all suicides and homicides cannot be prevented. But some sort of probability statement is inherent in all medical practice. I would estimate it still happens to me about every three weeks. Something isn't right and I don't have an exact answer. It becomes an obsession to an extent. Laying awake in bed. Getting up to do some additional research but realizing ahead of time that the yield is low. Realizing that no matter what decision you make - all of the outcomes are probably going to be suboptimal. You always get to the point where you can feel the adrenaline molecules rushing and your heart pounding. You know you are tense and starting to break into a light sweat. You readjust yourself in bed and realize your back and shoulders are as tight as a frozen hydraulic jack. You might actually check your pulse and blood pressure and find that they are elevated. It goes on like this until something happens and the intellectual crisis abates. Sometimes that takes a while - at one point months and a beta blocker to break up the stress induced tachycardia and hypertension. No I don't have generalized anxiety disorder - I am a doctor trying to deal with the uncertainties of being human. This YouTube video is fresh off my Facebook feed this morning from the APA. It features American Psychiatric Association (APA) President Jeffrey Lieberman, MD discussing the advantages of a so-called collaborative care model that brings psychiatrists into primary care clinics. I have critiqued this approach in the past and will continue to do so because it is basically managed care taken to its logical conclusion. As opposed to Dr. Lieberman's conclusion, the logical conclusion here is to simply take psychiatrists out of the picture all together. A prototypical example of what I am talking about is the Diamond Project in Minnesota. It is an initiative by a consortium of managed care companies to use on of these models to monitor and treat depression in primary care clinics in the state of Minnesota. In this model, patients are screened and monitored using the PHQ-9 a rating scale for depressive symptoms. Their progress is monitored by a care manager and if there is insufficient progress as evidence by those rating scales, a psychiatrist is consulted about medication doses and other potential interventions. The model is described in this Wall Street Journal article. As is very typical of articles praising this approach it talks about the "shortage" of psychiatrists and how it will require adjustments. In the article for example, the author points out that there would no longer be "one-to-one" relationships. There are two major problems with this approach that seem to never be not considered. The first is the standard of care. There are numerous definitions but the one most physicians would accept is care within a certain community that is the agreed upon standard provided by the same physician peers. In this case care provided by all psychiatrists for a specific condition like depression. There are professional guidelines for the care of depression and in the case of primary care guidelines for care provided by both family physicians and internal medicine specialists. One of the tenants of this care is that physicians generally base treatment of an assessment that they have done and documented. The only exception to that is an acceptable surrogate like a colleague in the same group covering a physician's patients when they are not available. That colleague generally has access to the documented assessment and plan to base decisions on. This is the central feature of all treatment provided by physicians and is also the basis for continuity of care. As such it also forms the basis of disciplinary action by state medical boards and malpractice claims for misdiagnosis and maltreatment. An example of disciplinary action based on this standard of care is inappropriate prescribing with no documented assessment or plan - a fairly common practice in the 1980s. "Managed care is one omnipresent constraint. Patients and clinicians must work together to fashion an appropriate treatment plan to take into account available resources and given the contingencies faced by the patient. If that plan-properly implemented-fails to prevent harm to the patient, the clinician should not face liability as a result." (p 164). They go on to explain how ERISA - the Employee Retirement Income Security Act of 1974 indemnifies managed care companies and their reviewers from the same liability that individual physicians have. They cannot be sued for negligence and the resulting harm. So managed care can take risks without concern about penalties as opposed to physicians who are obliged to discuss risks with the patient. Managed care organizations can also implement broad programs like depression screening and treatment without a physician assessment and consider that their standard of care. The second problem with the so-called collaborative care approach is that there is no evidence that it is effective on a large scale. I pointed out this criticism by a group of co-authors including one of the most frequently cited epidemiologists in the medical literature. That group has the common concern that a rating scale is a substitute for an actual diagnosis and everything that involves and given the recent FDA warning on citalopram. Dr. Lieberman uses a lot of that language in his video. The critics of psychiatry in the business community do the same. There appears to be a widespread uncritical acceptance of these euphemisms by politicians, businesses and even professional organizations. An actual individualized psychiatric diagnosis and quality psychiatric care gets lost in that translation. 1. Beck M. Getting mental health care at the doctor's office. Wall Street Journal September 24, 2013. 2. Gutheil TG, Appelbaum PS. Clinical Handbook Of Psychiatry And The Law. 3rd edition. Philadelphia: Lippincott Williams & Wilkens. 2000, p 164. 3. Nunberg G. Going Nucular: language, politics, and culture in confrontational times. Cambridge: Perseus Books Group, MA 2004. 4. American Psychiatric Association Principles of Medical Ethics with Annotations Espcially Applicable to Psychiatry. 2009 version. I suppose I was one of millions of disappointed viewers who tuned in to Saturday Night Live last night. One of the skits was to show the first used car commercial. The commercial uses the familiar "crazy" motif, implying that the business uses an irrational pricing strategy that favors the customer. Practically every television market has a business that uses this approach for selling cars, appliances, stereos, you name it. I suppose that some comedians would suggest that this is commentary on these commercials as a rationale for the video. In the same show there was a skit about a drunk uncle. At one point the drunk uncle introduces meth nephew - portrayed by an actor for the AMC series Breaking Bad. I can recall the comedic placement of an alcoholic dating back to The Andy Griffith Show's Otis. Associating comedy with mental illness is stigmatizing. That is not an original thought and I am sure that some people have written about it before. I am sure there is a thesis somewhere submitted for degree requirements that looks at the rationale and the pros and the cons. For me the straightforward analysis is that it is a reflection of the disproportionate noise in the media about psychiatry and mental health. That is closely followed by the fact that there are no similar comedic approaches to other diseases. Where are the skits about an uncle with cirrhosis, chronic pancreatitis or cancer? Or the uncle in prison for vehicular homicide while intoxicated? I also can't help but notice if you were not laughing at the Tina Fey character in the commercial what were you thinking? I was thinking about a situation where a family might notice a personality change or a change in thinking like the one described in this skit and what they would do about it. There are no clearly defined public health approaches to these problems. People get concerned, they get very uneasy, they don't know what to do about it, and complications happen. They may actually bring their relative down to the local Emergency Department only to find that they are declared "not imminently dangerous" and discharged with a number to call for an outpatient appointment. If their family member is in need of medical detoxification from alcoholism, they may be discharged with a bottle of lorazepam and instructed on how to detox them at home. I was thinking about the millions of Americans out there who have had this happen, have inadequate treatment, and never recover. Their role in the family is permanently altered or disrupted. I was thinking about the legal approach to some of these problems and the issue of criminal responsibility. That dovetails with the lack of a public health approach because one of the possible complications is that a crime gets committed during an episode of mental illness. Of course it is a crime based on the assumption that the person is able to appreciate what they are doing and that it is unlawful. In the majority of cases it is not likely that a severe crime will be understood that way and the defendant will typically get psychiatric treatment in prison or a county jail. The civil legal approach is as problematic. An actual or practical "imminent dangerousness" standard for treatment leaves huge numbers of people untreated and acutely mentally ill.
For all of these reasons, these skits were not funny to me. I like Tina Fey and think that she is a comedic genius, but I didn't crack a smile. I think it will be a test of mental health advocacy groups everywhere to see what they say about this. Some have criticized SNL before but I have not seen anything about this skit so far. All of the discussions about the problems with the lack of adequate mental health treatment in this country and the associated public health disasters have no traction as long as we continue to think of mental illnesses and addictions as comedy. I am back at my usual computer tonight and feeling much better after attending the UW Psychiatric Update. It was well attended and I estimate there were about 400 people there - mostly psychiatrists. The conference brought in several people who were instrumental in the DSM-5 to talk about the thinking and research that went into it. The resulting story is one that you will never hear in the press or other media. The story is based on science as opposed to the irrational criticisms in the media and that science is written about and discussed by brilliant people. I will try to post a few examples, and wish that it had been presented to the public. The discussion produced for public consumption was not close to reality and it was a further example of how stigmatization of the profession prevents relevant information from reaching the public. It seems that the most we can hope for is an actual expert being placed in a staged debate or responding to some off-the-wall criticism - hoping to interject a few valid points. That is a recipe for selling the sensational and leaving out the scientific and rational. Just how far off the media is on this story is a mark of how skewed that perspective is. Let me start with the disclosures. There were 14 presenters and 10 of them had no potential conflicts of interest to report. That included one work group chair. One of the presenters suggested that the political backlash against psychiatrists affiliated with the industry and the DSM limit on the amount of money that could be earned from the industry limited access to some experts and probably limits drug development. His question to the audience was: "What if it means that 10 years from, all we have to prescribe is generic paroxetine and generic citalopram? What if we have no better drugs?" It would be interesting to know who was specifically not able to participate in the process due to these restrictions. There were primarily 2 presenters with extensive industry support primarily in their role as consultants to the industry. One of them joked about his level of involvement: "Based on my disclosures you should probably not believe a thing that I say." He went on to give an excellent presentation replete with references to peer reviewed research. Before I go on to talk about specific speakers I want to address another frequent illusion about psychiatrists and that is that they are primarily medication focused and have minimal interest in other treatments. That is convenient rhetoric if you are trying to build a case that psychiatrists are all dupes for the pharmaceutical industry and that drives most of their waking decisions. During the presentation of the pharmacological treatment of obsessive compulsive disorder, the presenter clearly stated: "It could probably be said that we are still waiting for an effective medication for obsessive compulsive disorder." Certainly, the section on autism spectrum disorder presented the current AACAP practice parameters and the fact that there is no medication that treats the core features but some that that have a "mild to modest" effect on some features or comorbidities. Three of the four breakout sessions in the early afternoon of day 1 were psychotherapy focused. I attended Mindfulness Based Cognitive Therapy and Recurrent Major Depression with about 200 other participants. We were guided through two interventions that could be used in follow up individual sessions as well as groups. The efficacy of preventing recurrent major depression with this modality alone was discussed. The Psychotherapeutic Treatment of Insomnia and Pediatric Post Traumatic Stress Disorder were discussed in parallel sessions. In the PTSD lecture, it was pointed out that there is no FDA approved medication for the treatment of this disorder and that the gold standard of treatment is Trauma Focused Cognitive Behavior Therapy (CBT). That's right a psychiatric conference where the treatment of choice is psychotherapy and not medications. What about he individual presentations on the thinking behind the DSM? I was thoroughly impressed by Katharine A. Phillips, MD Chair of the DSM-5 Anxiety, Obsessive-Compulsive Spectrum, Post Traumatic Stress Disorder Work Group. Reviewing the structure of the DSM-5 as opposed to the DSM-IV shows that all of these disorder previously considered anxiety disorders are now all broken out into their own categories. She discussed the rationale for that change as well as the parameters that were considered in grouping disorders in chapters - clearly an advance over DSM-IV. She talked about the two new disorders Hoarding and Excoriation (Skin Picking) Disorder and why they were OCD spectrum disorders. She talked about insight and how it varies in both OCD and Body Dysmorphic Disorder (BDD). She discussed the new OCD Tic-Related Specifier and its importance. Most importantly she discussed how the decisions of the Workgroup will improve patient care. The most obvious example, is the case of BDD where both the delusional and non-delusional types respond to SSRIs and those are the drugs of choice and not antipsychotics. By grouping BDD in with Obsessive Compulsive Disorder and Related Disorders recognition and appropriate treatment will probably be enhanced. Dr. Phillips is the researcher who initially discovered the treatment response of BDD to SSRIs. She is also a rare lecturer who does not pay much attention to the PowerPoint slides but speaks extemporaneously and authoritatively on the subject in a parallel manner. Susan E. Swedo, MD was the Chair DSM-5 Neurodevelopmental Disorder Work Group. She talked in detail about the elimination of the Pervasive Developmental Disorders diagnosis and how the Autism Spectrum Disorder diagnosis reflected current terminology in the field over the past ten years and how it basically eliminated 5 DSM-IV diagnoses (Autistic Disorder, Asperger Disorder, Pervasive Developmental Disorder, Childhood Disintegrative Disorder, and Rett Disorder). She pointed out that the Workgroup could only locate 24 cases of anyone who had ever been diagnosed with Childhood Disintegrative Disorder and that the CDC's epidemic of Autism was probably related to diagnostic confusion and overlap between PDD-NOS and Attention Deficit Hyperactivity Disorder. She gave a detailed response to the "publicized concerns about DSM-5" including decreased sensitivity to improve specificity, the loss of the uniqueness of the Asperger Diagnosis, and the fact that pre/post research in this area won't be comparable. She showed a detailed graphic and comparison of DSM-IV and DSM-5 criteria to show why that is not accurate. I came away from this conference refreshed and more confident than ever about the reason for writing this blog. I had just seen some of the top scientists and minds in the field and why the DSM was really changed - not what you read in the New York Times. If you are a psychiatrist - there were plenty of reasons for a DSM-5 and if you read this far, it is only the tip of the iceberg. As any reader of this blog can recall one of my foci is to expose the anti DSM 5 rhetoric for what is was. One the the main points by DSM detractors was diagnostic proliferation or more total diagnoses. This implies more diagnoses, more prescriptions, and more money for psychiatrists and pharmaceutical companies. Another spin was that it was the intent of organized psychiatry to "pathologize" the population. I put up a table on this issue in a previous post and at that time did not have the final number of diagnoses. As of today I have the final number and it is 157. According to the presenter that means that a total of 15 diagnoses were eliminated from DSM-IV to DSM 5. The total diagnoses in DSM 5 did not increase as the detractors predicted - they decreased by 15. 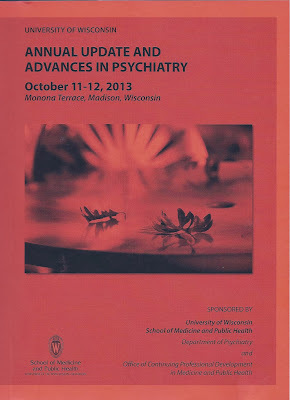 I was at a conference today put on by the University of Wisconsin Department of Psychiatry entitled Annual Update and Advances In Psychiatry. The Introduction by Art Walaszek, MD acknowledged that this was the first in a series that replaces a long tradition of courses run by John H. Greist, MD and James W. Jefferson, MD: "Jeff Jefferson and John Greist ran this conference for 31 years." That is an amazing track record and record of achievement and a contribution to psychiatry in the Midwest. 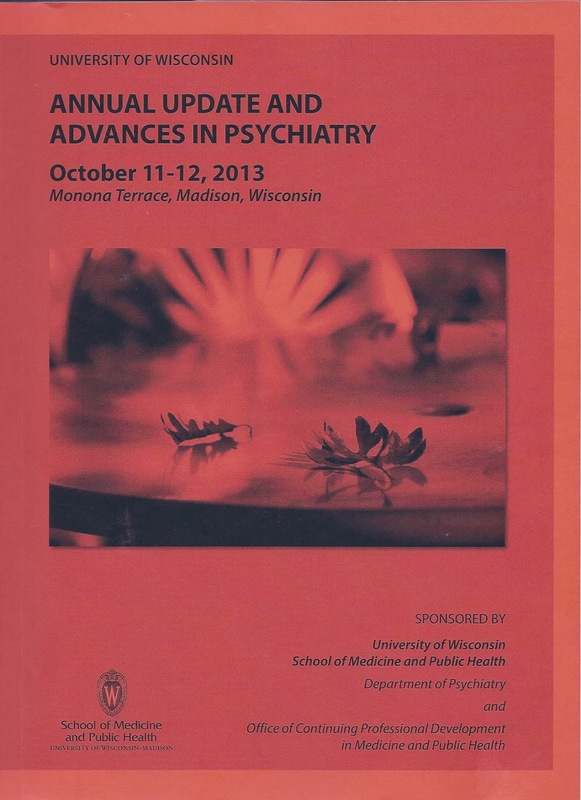 I don't know of many psychiatrists who were not aware of this conference with the alliterative titles like: "Quaffing Quanta of Quality from Quick Witted Quinessentialists" or the Door County Course they regularly taught. They have been a model of scholarship and professionalism and continue to be. The first speaker today was Alan Schatzberg, MD. He posted the information about the total diagnostic categories in DSM 5 an other important changes and how they occurred. Per my previous post about the DSM 5 lectures by Jon Grant, MD the DSM 5 effort was outlined in addition to some critical information on how stigma affects psychiatric diagnosis. For example, when the DSM 5 work group wanted to add mild neurocognitive disorder a well known historian of psychiatry came out and said it would add countless people who had normal memory impairment associated with aging. When neurologists added mild cognitive disorder to their diagnostic nomenclature (an equivalent diagnosis) no such claims were made about neurologists. In terms of the effort, Dr. Schatzberg pointed out that there were 13 conferences from 2003-2008 that produced 10 monographs and over 200 journal articles. Dr. Schatzberg and his colleagues presented a ton of information today on what really happened with DSM 5 development. I will try to summarize and post additional comments when I can post from a more user friendly computer. I wanted to keep the post more on the scientific and debunk another common refrain from the naysayers before the DSM 5 was printed. That involved the so called "bereavement exclusion" that basically says that a person cannot be diagnosed with major depression if they are seen during an episode of grief. One question that was never brought up in the popular press "Where did this convention came into the diagnostic criteria in the first place?" I quoted a text from about the same time (see third from last paragraph) that makes this convention seem even more arbitrary. It turns out the original bereavement exclusion began in DSM-III not from any research basis but from convention that was subjectively determined by the authors of DSM-III. Contrast that with the research done by Zisook, et al. You would think that some of the self proclaimed level headed skeptics out there would have referred to this critical paper on the issue rather than speculative attacks on the field. Incorporating these scientific findings was one of the reasons that the DSM was updated. Stay tuned for more of the hard data and insider info on DSM 5. 1: Zisook S, Corruble E, Duan N, Iglewicz A, Karam EG, Lanouette N, Lebowitz B, Pies R, Reynolds C, Seay K, Katherine Shear M, Simon N, Young IT. The bereavement exclusion and DSM-5. Depress Anxiety. 2012 May;29(5):425-43. doi: 10.1002/da.21927. Epub 2012 Apr 11. Review. Erratum in: Depress Anxiety. 2012 Jul;29(7):665. PubMed PMID: 22495967. Supplementary 1: The DSM-5 Guidebook by Donald W. Black, MD and Jon E. Grant, MD came out in March 2014. Table 1. (p. xxiii) lists the total diagnoses is DSM-5 as 157 excluding "other specified and unspecified disorders". "Some Sort of Mental Health Issue"
I was getting ready for work yesterday morning and watching The Today Show in the background as usual. Suddenly there was the story of a young woman trying to ram the security barriers at the White House and then being pursued in a high speed chase down Pennsylvania Avenue. It eventually showed a direct confrontation with law enforcement and them opening fire on her through the window of her vehicle. There was an initial report saying that she had fired shots but she was unarmed. The police discovered her one year old daughter in the car and removed her. The acute reaction captured on film was surreal. There were descriptions of some of her recent behavior and thoughts. A police official commented that the security barriers "worked" as though this was an assault by a terrorist. A different official commented how her daughter was "rescued" by the police. People were talking as though this was an actual assault by a terrorist. The last person I heard was a politician who made the quote at the top of this post and finally suggested the real problem. Confrontation between people with severe mental illnesses and law enforcement are very common. During my years of acute inpatient work I have talked with many people who have been injured in every imaginable way during these confrontations. In some cases they were themselves engaged in very dangerous and aggressive behavior as the direct result of a mood disorder or a psychosis. In other cases law enforcement just misinterpreted their behavior. That happened most commonly when the person refused to comply with what the officer wanted them to do. These confrontations are always high risk situations because most people in society know that it is in their best interest to be law abiding and comply with the police. The people who don't are criminals or people with impaired judgment due to mental illness or intoxication states. Even if the police can make that distinction rapidly that does not mean they can easily use a different approach to the person with mental illness. Police officers have been injured or killed in these situations. There seems to be a great deal of misunderstanding and continued bias about how these situations can occur. It can happen as rapidly as waking up one morning finding out that your entire state of consciousness has changed. That gas company truck across the street is there to monitor you and direct microwaves at you. The phones and your computer are bugged. Going to work that morning you decide you need to take evasive action because it seems like you are being followed. Your anxiety levels build all day and that night at home you can't sleep. You decide you need to move the refrigerator in front of the door because you had the thought that it would be too easy for government agents to kick the door down and grab you. You do a Google search on microwaves and decide these people are trying to do a lot more than harass you - they are trying to kill you. You start to make plans on that basis. That is how paranoid delusions evolve and how they change your behavior. You are no longer making rational assessments of the environment. Your brain has come up with a theory and you are now interpreting all of the environmental information according to that theory. When I approach the problem psychotherapeutically, I generally explain that delusional thoughts are very low probability explanations or interpretations of an event in the environment. I illustrate this by asking the question: "If we had 100 people in the room right now - how many of them would agree with what you just told me?" Many people know that hardly anyone would agree with them, but that doesn't stop them from continuing to misinterpret the data or trying to cast me with everyone else who either doesn't believe them or is just saying that they are "crazy". Before I outline an approach to the problem of people experiencing episodes of psychosis or mania and running into problems with law enforcement consider what gets in the way of any of early intervention? Keeping with my cardiology comparison from a previous post - most people know that chest pain is a warning sign for a possible heart attack. With continued public health interventions most people know cardiac risk factors. Public health intervention has been so effective that the current campaign is focused on decreasing the denial in women and decreasing cardiac sudden death in women. Two generations of public health intervention are associated with a decreasing rate of cardiac mortality. How does that compare with psychosis and mania? I have never seen a public service ad advising about the warning signs of psychosis or mania. There are countless euphemisms for acute changes in a persons mental status. The public treats it like a mystery. When a tragedy occurs there is often no explanation or an inadequate one like "some sort of mental illness." The cultural approach is an obstacle to a rational approach to helping affected individuals. Stigma is considered to be a factor, but it could as easily be an artifact of the process. What would be a better approach? I have been advocating a public health approach to the problem for a long time now. At a political level there is a lot of confusion about whether this is a firearms issue. Firearms are just a subset of the problem. The overriding public health goal is to get people the help that they need as soon as possible. Our current system of care is set up to provide minimal care to people with severe mental illnesses. The level of care and condition of the facilities where the care occurs is widely known in communities and most people do not want to access these facilities for help. I hear a lot about the concern that someone is going to be stigmatized by treatment at a psychiatric facility. I think it is as likely that many facilities are substandard physical plants that are poorly managed. Based on the length of stay policies alone, nobody wants to bring their relative to a facility that has a reputation for discharging partially stabilized people back into the community. The long term goal needs to be improving the quality of psychiatric facilities in addition to changing the culture about severe mental illness. I thought of a public service announcement that would potentially have the same advertising power as some of the more popular health spots like the "7 warning signs of cancer". I call it the 4 warning signs of severe mental illness. A concerted effort to focus on severe mental illnesses that can potentially lead to errors in judgment is a logical way to approach this problem. Based on my previous paragraph it takes a much more enlightened approach to treating the problem. Health care systems in general are not friendly to people with severe mental illnesses. There are no specialty centers designed to cater to their needs like the high margin businesses get. Many of these health care organizations sponsor walks for mental illness and other programs like National Depression Screening day. But none of them say - if you have these symptoms we want to see you and treat you in a hospitable environment. That attitude has to change to prevent the loss of innocent lives as the direct result of severe mental illness. Before anyone gets the wrong idea, this post is not about pet therapy. 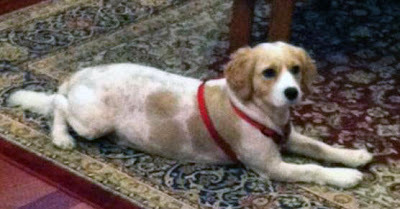 It is not about the purported advantages of owning a dog. It is not even about the new research on dog intelligence that I was frankly surprised by, especially the research showing how easily dogs can beat non-human primates on specific tasks. So much for that massive frontal cortex conferring supreme advantage over the animal kingdom. No - this is about managed care and using the term "dog" in its pejorative context. Several years ago, I was burned out and suffering from the type of large scale mismanagement that is so common in organizations that run on managed care principles. I attempted to approach the problem with humor by reading Dilbert cartoons. Read the first few pages in the Dogbert Management Handout to see what I mean. I soon realized that this stuff was too close to the truth about health care management and decided to look for other management styles. I happened across the work of Peter Drucker and his ideas about managing knowledge workers that were considered revolutionary. There was certainly nothing like that going on in health care. The managed care approach to managing physicians was to actually treat them like they were not knowledge workers but assembly line workers. Drucker's stroke of genius was in recognizing that managers know much less about products and processes than knowledge workers and that the business was essentially the product of the knowledge workers. Managed care techniques are diametrically opposed and are based on the fact that business guidelines are somehow relevant to medical care and even may actually be called medical quality. There is no health care process more autocratic and primitive than managed care. I have reviewed how this bizarre set of circumstances evolved in several posts on this blog. Along the way, I also interviewed a health care business management expert and asked him if there were any definitive texts that are used to train business people about managing health care and he referred me to the text Strategic Management of Health Care Organizations. I started to read and study the text, initially trying to find out why Drucker was completely ignored by health care managers. That was when I encountered the BCG Analysis for a Health Care Institution (p 254). BCG is an abbreviation for Boston Consulting Group who came up with this technique for analyzing products and services. In this case, there was a four quadrant graph that differences in market growth rate and relative market share position. I don't have permission to reproduce it here so I will do my best to describe it briefly. The high growth/high market share quadrant was termed "Stars" and contained services like orthopedics, cardiology, oncology, and women's service. The medium/high and high/low quadrants were called "Cash Cows" and "Problem Children". The lower right hand quadrant of the graphic were the "Dogs" and they included psychiatry, ENT, pediatrics and others. I am no financial analyst, but what is wrong with this picture? Let me give you a hint. If you have a portfolio of medical services and one of them is selected for rationing and the others are not - it should easily end up in the Dog quadrant. The selective rationing of psychiatric and mental health services is a known fact for the last 30 years. When you ration a service you naturally slow its growth and reduce the market share. The market share is reduced even more precipitously when you start shutting down bed capacity and hospitals. Early in the course of all of these events some high profile teaching units in hospitals affiliated with prestigious medical schools were shut down and it was described as being secondary to a lack of reimbursement from companies using managed care models. If you are in a business that severely distorts the market by controlling growth and market share it makes little sense to pretend that you can analyze portfolios across an imaginary market and make decisions about resource allocation in an organization. If you were a physician unlucky enough to be trapped in this process it played out in several ways. There were endless meetings that formed the base of misinformation. There was the suggestion that productivity was the only fair way to reimburse physicians and the implication that some physicians were much less productive than others. That was a good way to provoke the competitive, even though in practically all cases that was not true. Then there was the usual barrage of financial information. Overhead figures from who knows where. The suggestion that physicians may need to cover the salaries of any physician assistants working with them. It was an unending painful process designed to give the appearance that physicians had a say in the business, except at every critical decision they did not. In the end all there were was a long series of Dogbert management PowerPoints. I have not seen the latest edition of the book and I wonder if there have been any additional pejorative classifications for mental health or psychiatry. One thing is for sure. You don't end up in the Dog quadrant because of lack of real demand or free markets. You end up in the Dog quadrant because of managed care and their supporters in the government. And then they can use this analysis to remove even more resources. There was an opinion piece in the New York Times a few days ago entitled "Psychotherapy's Image Problem". The author goes on to suggest that despite empirical evidence of effectiveness and a recent study showing a patient preference for psychotherapy - it appears to be in decline. He jumps to the conclusion that this is due to an image problem, namely that primary care physicians, insurers, and therapists are unaware of the empirical data. That leads to a lack of referrals and for some therapists use of therapies that are not evidence based - further degrading the field. He implicates Big Pharma in promoting the image of medications and that the evidence base for medication has been marketed better. He implicates the American Psychiatric Association in promoting medications and suggests that the guidelines are biased against psychotherapies. I am surprised how much discussion this post has received as though the contention of the author is accurate. Psychotherapy has no image problem as evidenced by one the references he cites about the fact that most patients prefer it. It wasn't that long ago that the famous psychotherapy journal Consumer Reports surveyed people and concluded that not only were psychotherapy services preferred, they were found as tremendously helpful by the majority of people who used them. That study was not scientifically rigorous but certainly was effective from a public relations standpoint. The idea that psychiatry is promoting drugs over psychotherapy seems erroneous to me. The APA Guidelines certainly suggest psychotherapy as first line treatments and treatments that are part of selecting a therapeutic approach to the patient's problems. Psychopharmacology is also covered and in many cases there are significant qualifications with the psychopharmacology. Further there are a number of psychiatrists who lecture around the country who are strong advocates for what are primarily psychotherapeutic approaches to significant disorders like borderline personality disorder and obsessive compulsive disorder. Psychiatrists have also been leaders in the field of psychotherapy of severe psychiatric disorders and have been actively involved in that field for decades. Even psychopharmacology seminars include decision points for psychotherapy either as an alternate modality to pharmacological approaches or a complementary one. What is omitted from the arguments against psychiatry is that many payers do not reimburse psychiatrists for doing psychotherapy. The author's action plan to politically promote the idea that psychotherapy is evidence based and deserves more utilization is doomed to fail because the premises of his argument are inaccurate. There is no image problem based on psychiatry - if anything the image is enhanced. There is definitely a lack of knowledge about psychotherapy by primary care physicians and it is likely that is a permanent deficit. Primary care physicians don't have the time, energy, or inclination to learn about psychotherapy. In many cases they have therapists in their clinic and just refer any potential mental health problems to those therapists. In other cases, the health plan that primary care physicians work for has an algorithm that tells them to give the patient a 2 minute depression rating scale and prescribe them an antidepressant or an anxiolytic. And that is the real problem here. Psychotherapists just like psychiatrists are completely marginalized by managed care and business tactics. If you are a managed care company, why worry about insisting that therapists send you detailed treatment plans and notes every 5 visits for a maximum of 20 visits per year when you can just eliminate them and suggest that you are providing high quality services for depression and anxiety by following rating scale scores and having your primary care physicians prescribe antidepressants?. The primary care physicians don't even have to worry if the diagnosis is accurate anymore. The PHQ-9 score IS the diagnosis. Managed care tactics have decimated psychiatric services and psychotherapy for the last 20 years. If I am right about the real cause of the decreased provision of psychotherapy, the best political strategy is to expose managed care and remember that current politicians and at least one federal agency are strong supporters of managed care. Brandon A. Guadiano. Psychotherapy's Image Problem. New York Times September 29, 2013. 1. The myth of dangerousness is all encompassing. At some point the government and the managed care industry wanted to make the rationale for admissions to psychiatric units as difficult as possible to ration inpatient psychiatric care. The standard question is: "Is this person a danger to themselves or anyone else." This bias has completely disrupted inpatient care. We now have desperate people who should have been admitted who are lying about suicidal ideation in order to get admitted. We have people who don't need to be admitted saying they are suicidal and getting admitted. The point is that this criteria is irrelevant for a whole range of indications for inpatient treatment. As an example, anyone with a familiy member who has severe mental illness recognizes that there are times when they are completely unable to function due to their illness. Leaving that person at home to fend for themselves in that condition is not only a bad idea it is inhumane and yet they may not meet somebody's criteria for "dangerousness". 2. Length of stay in all community based psychiatric units is based on DRG payments. That means there is a set reimbursement for a diagnosis related stay independent of how long the patient is in the hospital. As an example a psychosis DRG is one of the commonest DRGs and the last reliable figure I have is that it pays $4,500 per DRG. That is set by the federal regulatory agency for Medicare reimbursement but practically every managed care and insurance company pays the same way either per admission or per discharge. If the patient stays 5 days that is nearly the mythical "$1,000/day" that most people believe the hospital is reimbursed. If the stay is 30 days that is $150/day and less that the cost of most board and care homes. This is a strong financial incentive for the hospital to discharge the patient as soon as possible. 3. Despite an emphasis on biological treatments in inpatient settings, there really are no biological treatments that work in the 5 days. That is the length of stay most hospitals want their patients discharged in. Most inpatient experts will tell you that severe mental illnesses (as opposed to crisis intervention) often require at least 2 - 4 weeks for stabilization. 4. Available social service providers have no incentive to assist the hospital with placement irrespective of whether there is adequate housing or not. The hospital is the least expensive place to house the patient, even if they are stable for discharge. 5. The economic incentives result in a large patient population that circulates from homelessness to emergency departments to inpatient care. These same incentives result in the patient being exposed to no single environment that results in their stabilization. In fact providing thousands of dollars of discharge medications to people who will probably never take them is a massive inefficiency that creates an illusion that inpatient treatment has done something. My personal conversations and correspondence with many outpatient psychiatrists confirms that most of them consider inpatient care to be a complete waste of time and they acknowledge that they have no good place to send their patients anymore for stabilization. 6. The same managed care companies that denied hospital claims many years ago currently own the facilities. They now have case managers essentially running their inpatient treatment and telling the physicians there when a patient must be discharged. If the doctors working in that environment don't go along they can be forced out or placed in an uncomfortable enough position that they quit. Managed care companies frequently have proprietary and arbitrary guidelines that dictate when people are discharged. It is not a coincidence that the suggested lengths of stay are expected to maximize profits and have nothing to do with quality psychiatric care. 7. Utilization reviewers still exist. Their job is basically to argue with inpatient physicians and harass them enough so that they discharge the patient. These physicians were supposed to be "peers" but in my experience talking with them over the years, it was apparent that I was not talking with anyone who had actually worked in an inpatient unit. Their job was clearly to force me to get the person out of the hospital or play the trump card by denying payment and getting the hospital to force me to get the patient out. You might ask yourself why they are necessary if their company is paying a fixed fee for inpatient care and I think that is a good question. 8. The trivial reimbursement for inpatient care deincentivizes access to other assessment and treatment modalities that the patient may need such as specialty consultation, brain imaging, and electroencepaholgraphy. Patients may be told to come back for outpatient appointments when the treating psychiatrist knows that patient will not return for the necessary appointments and will probably be readmitted soon with the exact same medical problem. All of these issues combined are why people are discharged to the street or put on a bus. You can see that the common theme here is actually the rationing of services by the government and managed care industry as well as psychiatry's inability to deliver the quality of care that psychiatrists are trained to provide in this restricted environment. The suggested solutions in the authors article seem to be written by Joint Commission bureaucrats and will have little impact. This is a problem that can be solved by psychiatrists but it has to start with a quality approach. Inpatient specialty training in psychiatry with a focus on providing state of the art assessment and care is necessary. It is an ideal place to begin to attend to the cognitive dimension of psychotic disorders and mood disorders. Civil commitment laws need to be reformed with a focus on treatment rather than dangerousness. There needs to be an appropriate hand-off from the hospital team to a community team and a housing team. It is the time to stop demanding "cost effective" treatment from a system that has been practically rationed into non-existence. It is time to invest in quality to the point that patients with severe mental illness and their families can expect that there will be psychiatric services available as a resource on par with the cardiology services they expect for any middle aged person with chest pain. 1. Das S, Fromont SC, Prochaska JJ. Bus Therapy: A Problematic Practice in Psychiatry. JAMA Psychiatry. 2013 Sep 25. doi: 10.1001/jamapsychiatry.2013.2824. [Epub ahead of print] PubMed PMID: 24068366.